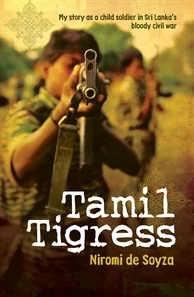 TAMIL TIGRESS: MY STORY AS A CHILD SOLDIER IN SRI LANKA’S BLOODY CIVIL WAR. | Niromi de Soyza (Allen and Unwin, Sydney, 2011), pp. 308, Price not mentioned. Writing about his literary career, Robert Frost once wrote: “I have never started a poem yet whose end I know. Writing a poem is a discovery”. I was in the same predicament when I started reviewing Niromi de Soyza’s absorbing account as a Tamil Tigress. I planned a brief review, but then I realized that such an account will not enable the discerning readers of SAAG to understand the twists and turns of Tamil militancy and how the Tigers degenerated into one of the most ruthless and inhuman terrorist organizations in contemporary world. I felt that the best way to do justice to the book is to sum up Niromi’s life as a Tigress in her own words. This alone is the justification for the unusually long essay. The book is an unfolding saga which describes the best and the worst of the Tigers. Niromi has adopted a no holds barred approach in describing the day to day life of a guerrilla. She gives equal attention to the perpetrators of violence as to their victims. The book is an important source material for understanding contemporary Sri Lanka. The period covered by Niromi is 1987-88, the turbulent days when the Indian Peace Keeping Force (IPKF) was stationed in the North and the East ostensibly to protect the interests of the Tamils. Unfortunately, for a variety of reasons, the IPKF came into conflict with the Tigers, leading to loss of lives on both sides. The IPKF had to withdraw from Sri Lanka, without attaining the objectives it had set before itself. Soon after the withdrawal of the IPKF, the Tamil areas came under LTTE control. What was the magnetic pull of Prabhakaran which attracted many young boys and girls into the fold of the Tigers? Why did Niromi part company with the Tigers? These and other inter-related questions are succinctly tackled by the author. The book also provides invaluable glimpses into the social history of the Tamils. It will be a good idea if the book is translated both into Tamil and Sinhalese so that it reaches a wider reading public in Sri Lanka and among the Sri Lankan Tamil diaspora. The many acts of discrimination perpetrated by the Sinhalese dominated governments and attempts to build the Sri Lankan nation on the basis of Sinhalese language and Buddhist religion gradually led to the parting of the ways of the two communities. “Having lost its innocence in Black July, it no longer had the ordinary hustle and bustle of a normal town. Against the backdrop of a dusk-to -dawn curfew, its streets were now inhabited by anxious citizens, frightened refugees, arrogant military and furtive militants . . . Death, violence and terror had become part of life”. Niromi came under the spell of the Tigers very early in life. She became aware of the pathetic plight of her community through narratives of friends and class mates and through reading militant Tamil literature. The first expression of her revolutionary ardour was her literary venture through poetry which attracted the attention of Tamil militant groups. As a school student, Niromi “could only watch with envy the young men who had returned with military-style training from India and Lebanon now openly setting up camps in various neighbourhoods”. During that time no militant group wanted to enlist women as combatants. Among the Tamil militants she was attracted more by the Tigers. “They were considered the most successful group in the battlefront. The black thread around their neck that carried the cyanide capsule or the Kuppi gave them added prestige”. The “charismatic” Prabhakaran was fast gaining popularity among the Tamil youth. In their blind admiration for Prabhakaran the Tamils were willing to justify the crimes the Tigers committed at that time. This can be understood from the justification they put forward to the killing of “traitors” at that time. The brutal killing of Anandarajah and the killing of militants belonging to rival groups like TELO, EPRLF and PLOTE were not only an illustration of Tigers’ single minded determination to emerge as the only credible fighting force, but was also a convincing proof of Prabhakaran’s belief that ends justify the means. The common man was unhappy, but, at the same time, he justified the killings. Niromi describes this phenomenon as follows: “I know this was wrong and yet another part of me refused to denounce the Tigers because without them, the Tamils had no hope of freedom and dignity”. In another part of the book, Niromi adds, “We were so much in awe of the Tigers we managed to justify everything they did. We even excused Prabhakaran’s recent marriage to his lover despite his earlier stance on lovers and marriages, which had led to the breakaway faction TELO. We said it was okay because his wife was not a fellow Tiger”. The militants were “becoming more and more acceptable” despite rumours of “kidnapping, in-fighting, murder and extortion”. Niromi attended school regularly but was hoping that the day would soon come when there will be room for female Tamil militants. The continuing spell of emergency, the dusk-to-dawn curfew and regular bombing raids convinced Niromi that the time for a negotiated settlement was over. “The Tigers were right: the only choice left for the Tamils was to fight back. As we spent more and more time hiding in our bunkers from bombing raids and receiving news of more deaths and damage, I was becoming increasingly convinced that I should join the militants and fight this injustice”. Niromi was enthralled when a pro-Tiger newspaper published a poem with the headline “the hands that wore bangles now carry weapons”. After a few days, the official Tiger magazine, Kalathil, featured a female Tamil Tiger in full combat gear. Niromi approached a local Tiger leader Muli Shankar and requested him to enlist her as a guerrilla. “You are a child” Muli Shankar exclaimed loudly, “Why don’t you finish school first and may be we can talk about it then”. Niromi would not give up, she approached Muralie, the head of the Students Organisation of Liberation Tigers (SOLT), who was in charge of galvanizing support from the student community. The response from Muralie was the same. The Operation Liberation was in full swing and Niromi’s mother, in order to escape the travails of war, decided to take her children to Kandy. Niromi was determined not to leave Jaffna and along with her friend Ajanthi went to the SOLT office. Realizing that this time his efforts to dissuade will not succeed, Muralie decided to call Thileepan, the head of the political wing of the Tigers in Jaffna, to talk to Niromi and Ajanthi. Thileepan was brutally frank: “The movement that you see from outside is not the same inside. It involves starvation, death and injury. It is physically very demanding… There will be none of the comforts that you are used to”. Thileepan asked them to ponder over all these things and, even after that, if they were determined to join the movement, “inform your families in writing”. In her letter to her mother, Niromi declared, “From now on I am not only your daughter, but the child of an entire people. Amma, please do not pursue me because I chose to leave”. Her letter naturally shattered her mother and younger sister Shirani. Niromi and Ajanthi soon realized that the life of a guerrilla was not a bed of roses, but they adjusted to the new situation without any complaint. Soon the Operation Poomalai took place, when the officers and jawans of the IPKF landed in Jaffna. Niromi expressed the happiness of the common people in Jaffna as follows: “There was a general feeling among the people that this meant the end of fighting”. She wondered what will be its impact on the Tigers. The Tigers were very skeptical about Indian intervention. It was extremely difficult for Prabhakaran to give up the life of a guerrilla and transform himself as a political leader participating in the democratic process. In June Niromi and Ajanthi, along with other girls, were asked to become volunteers and keep a watch of the Tiger outposts near the Jaffna fort, where the Sri Lankan armed forces were concentrated. During this period Niromi had a chance encounter with Roshan, who became extremely fond of her. The fondness soon developed into one sided love. However, all attempts made by Roshan to express his feelings were rebuffed by Niromi. Before long, the girls were shifted to another camp where military training was imparted to them. Before the departure to the military camp, Prabhakaran, who had returned from India few months earlier, addressed them. What were Niromi’s feelings before the encounter with Prabhakaran? “I walked into the room as if I was about to meet God. There was no doubt that Prabhakaran was our saviour, our hero. He was going to save the Tamils from destruction and gain for us an independent homeland”. The training camp was located in Thenmarachi; the first thing that was done was the distribution of cyanide capsules. Sub-machine guns were given to the guerrillas. The guerrillas constructed their own huts using sticks, dry coconut palms and ropes. The wakeup call was at 5 am. Since water was scarce, each guerrilla was given one cup of water for brushing teeth and washing. After taking the customary oath, the guerrillas underwent a grueling four hour physical exercise. The standard breakfast followed, consisting of red rice and tea. The guerrillas then were asked to assist in the construction of the commando base, with trenches around it. The lunch was red rice and pumpkin curry. It was followed by target practice. Dinner was always semolina pilaf. Strict discipline was enforced and those who did not conform were severely punished. At regular intervals Prabhakaran and other leaders visited the camp and exhorted the guerrillas to be brave soldiers and if possible join the ranks of Black Tigers. The spartan life resulted in dirt and grime all over the body, which smelt of stale sweat. What was nauseating about the camp, according to Niromi, was the overflowing toilet pit, with absolutely no privacy. Though the guerrillas were kept in the dark, dramatic changes were taking place outside. New Delhi, having proved that it will not countenance a military solution to the ethnic problem, was engaged in negotiating a peace accord with the Sri Lankan Government. Though the Tamils were the most affected party, the militants could make no inputs into the making of the accord. More important, having spent few months in India, Prabhakaran did not have any faith in the bonafides of the Indian Government. As Niromi has written, “Years in India had taught him not to trust the Indian Government, because it was India which encouraged the militancy… and now it pretended to play peace maker”. Prabhakaran was paranoid that the Government of India “might assassinate him to show allegiance to the Sri Lankan Government”. Niromi has quoted Prabhakaran’s words: “Like the Americans in Vietnam and the Russians in Afghanistan, the Indians in Tamil Eelam won’t last…If they don’t behave themselves, they will learn a very sorry lesson”. One day the guerrillas were driven to Sudumalai Amman temple, where Prabhakaran made his “first public appearance” and declared that he accepted the India-Sri Lanka Accord, reposed faith in India and resolved to surrender his arms. However, the duplicity of Prabhakaran became apparent when he told the guerrillas: “All our good ammunition was stacked before the surrender. We will continue to hand over the rest”. The guerrillas retained the sub –machine guns and AK 47s. Since the cease fire was in operation for few weeks, Prabhakaran resolved to wind up the camp for women guerrillas. He asked them to go home, but, at the same time, requested them to be in touch with the Tiger leadership, so that they could be mobilized when the war resumed. Niromi was thrilled to go home, “I could have decent showers, wear clean clothes, and be rid of the scourge of the camp – head lice”. Niromi had to lead a “dual life” at home for next few days. Her parents were happy that she “is back home for good”. She implicitly obeyed her parents, went to different churches and lit candles and “swore on the Bible never to return to the Tigers”. But in her heart of hearts, she was determined, “no one was going to jeopardize the allegiance I had sworn to Prabhakaran – not even God”. Thileepan’s fast ensued; culminating in his martyrdom and soon the armed conflict between the Tigers and the IPKF began. Niromi was once again back to her life as a guerrilla. During her stay with her parents, Roshan continued to chase her expressing his unbounded love, but Niromi continued to brush him aside. When the Tigers resolved to fight the IPKF, the odds were against them. Niromi has written that the general Tamil public believed that “the resumption of hostilities was Tigers’ fault. Deep down, I thought so too. I felt that everyone concerned, including the Tigers, had not given this accord a real chance”. In another part of the book, watching the Tamils moving towards the Nallur temple “for temporary refuge from the bombs”, Niromi writes “I saw in their faces sadness, indifference, disappointment, fear and, above all, I saw anger. It flashed in their eyes whenever they saw a Tiger”. The first place, where Niromi, along with her friends, was asked to defend was the Jaffna University, which had virtually become a “battle ground”. The IPKF had failed miserably in its attempt to capture the Tiger leadership; what is more, they lost thirty five commandos who were air dropped. The University campus was virtually under the control of the Tigers and they were defending it against artillery attacks. Niromi’s duty was that of a sentry in the main gate of the University. After few days, the guerrillas were asked to move over to Kopay and then to Neerveli. Despite heavy odds, the IPKF began to slowly advance and the Tigers had to beat a hasty retreat. The odds against the IPKF were due the fact that the territory was unfamiliar and they could not distinguish between civilians and Tigers. By the end of 1987, the IPKF was in full control of Jaffna peninsula. The Tigers could no longer “take shelter in a safe haven” because within hours the Indian soldiers turned up. Independent Tamil Eelam was becoming a distant dream, “To me, it felt like a dream beyond reach”. The guerrillas were asked to move towards the coast, from where, after lot of difficulties, they took a boat, landed in a safe place, trekked for several hours and reached a camp in the Vanni Jungles. The life in the camp was not idyllic. They had to construct huts, bring water from a distant stream, take precaution against wild animals and snakes. And when it rained it was virtually a deluge. On solitary nights, Niormi began to reflect about her past and, for the first time, started thinking about Roshan. “thoughts of him made me instantly feel better”. The routine continued for four months. Due to unhygienic conditions the guerrillas began to fall sick; and Niromi was infected with dermatitis. “The more I scratched the little water-filled sachs that infested my hands and legs, the more they turned into bleeding wounds. Our clothes, having worn without a change for nearly three months, had now turned into tatters, my only underwear, washed and worn, began to feel like sand paper against my skin”. After few days, Niromi was taken to a distant village to see a doctor. When she recovered she was taken to another base in the jungles, because the earlier base was attacked by the IPKF, and the guerrillas were compelled to withdraw leaving everything behind except their ammunition. It was obvious that the IPKF had infiltrated the jungles. Niromi became disgusted with the camp life in general and, what is more, with the attitude of the Tiger leadership towards ordinary cadres. She began to feel more lonely, more so because she lost two of her best friends during that time, Ajanthi and Muralie. One day, Mahathaya addressed the female cadres and told them that he had reports that some of them had broken the strict code of discipline; “one had propositioned a fellow comrade; another had playfully stuck her head next to a male comrade inhaling steam for his sinuses; but the third had committed the worst crime of all, and fallen in love”. Of the three girls named by Mahathaya two of them were discharged on the spot and the third, Nora was punished for “falling in love with Shantan”. She was asked to prove her loyalty to the organization “by always taking a frontline role at any confrontation with the enemy and by stealing an item from the enemy’s camp each time”. The logic of the leadership eluded Niromi. She remembered the case of a guerrilla who was ordered to shoot his father. “He had resigned after carrying out the orders and not before, to remain faithful to the organization”. This was nothing compared to the punishment meted out to Shantan. Shantan was brought in a jeep to the camp, was taken before Mahathaya . “Bang. It was just a single shot. Ayyo Shantan, wailed Nora and fell to the ground”. Niromi was shocked and expressed her feelings as follows “I could not comprehend the senseless murder of this young man. I felt sickened, confused and outraged all at once. But I knew whatever words I chose to use to comfort Nora none of them would express how I really felt or make that moment right again”. Niromi adds, “From top to bottom in our organization, everyone did whatever they pleased, so long as they could justify it as being good for the organization. I realized that murder and violence against our own was simply part of the culture. I had not been prepared for this. I had joined the Tigers so I could save my people from the clutches of an oppressive Government. All I wanted to achieve was Tamil Eelam, where we could be free. But it seemed to me that I had gone about it the wrong way. I had chosen violence to combat violence … I had done nothing to stop them. And, although I did not condone any of this, I, too, as a Tiger and a witness, now had blood on my hands – the blood of my comrades and my fellow Tamils”. “How could I remain loyal to any one … if I failed to be true to myself”. That night perhaps was the most restless night in Niromi’s life. The restlessness reached a crisis and she resolved that she should soon leave the organization. Two days later the camp was attacked by the IPKF and everyone ran for their lives, finally taking shelter in mud huts of their sympathizers. There Mahathaya met Niromi and justified his taking tough decisions “for the good of the organization”. Niromi felt that Mahathaya had trivialised her concerns. “And all the talk of blind loyalty made me nervous”. The LTTE was “ruled by the law of the gun… there was no room for fair hearing or for justice although these were the very things we were fighting for”. Another restless night followed, Niromi concluded that “while I shared their vision, I no longer shared their values”. In the morning Niromi went to Sengamalam and told him that she wanted to leave the organization. “I can’t cope any more, physically and emotionally. I am so tired. I just neded to get away from here“. Sengamalam warned that if she leaves LTTE, her life will be in grave danger, from rival organizations, from the Sri Lankan army and from the Indians”. All efforts made by Sengamalam and other comrades to dissuade Niromi from resigning were in vain. She wrote the Thundu (resignation letter), handed over the AK 47 and the kuppie and bid good bye once and for all to the Tigers. The life of violence was behind her. It goes to the credit of the Tigers that they helped Niromi to rejoin her parents. Her parents enrolled her in a boarding school in India, from where she passed with flying colours. Later she joined the University of Sydney for her graduate and masters degree in bio-technology. Niromi has become an Australian citizen, happily married with grown up children. The book gives valuable insights into the social history of the Tamils. Niromi and her comrades believed that they were ushering in a social change by breaking out of the shackles of servitude with the hope that it will elevate the status of women in a conservative society. “Little had I realized then that following the lead of a totalitarian male and volunteering to become suicide bombers was not women’s liberation. There is no doubting that these women were brave and heroic, but they served a master, never achieved equal status or the recognition of their male counterparts, and had marriages arranged by Prabhakaran himself”. Niromi’s father was a Vellala, but he fell in love with a girl belonging to Indian merchant class in Kandy. The Jaffna Vellalas considered the Malaiha Tamils to be inferior. Appamma, as Niromi used to call her paternal grandmother, disliked the marriage and showed her resentment to the daughter-in-law in several ways. Appa was expected to choose his bride from the Jaffna Tamil community- catholic, high caste, tertiary-qualified, professional, refined, fair-skinned women of impeccable character, whose parents were capable of giving him a fat dowry. Instead her father had fallen in love with Amma and married her without his family’s approval. However, Amma bore the brunt of ridicule with stoicism… The high caste Vellalas also disliked the militants, many of them belonged to the lower castes. Niromi quotes a neighbor complaining, “These uneducated low-caste boys have picked up guns and how they expect us to listen to them”. As is well known, among the militant organizations, the EROS and the EPRLF were keen to break the barriers between the Sri Lankan and the Indian Tamils, but in order of reputation among the Jaffna Tamils, the EPRLF was at the bottom of the rung, “their recruits were mostly the poorest from rural villages and they had done the unthinkable by recruiting women for their military wing”. On one occasion, perhaps in one of those lonely spells, Niromi was wondering how her family members would have reacted if she had married Roshan. To quote Niromi, “Roshan was all wrong for me; my family would never approve of him. I did not want to end up with him and humiliate my family even further. My father’s family would say that I had joined the Tigers for some Hindu, low caste man and not to fight for Tamil Eelam”. Despite the travails of the rigorous life in the camps, the girls occasionally had some fun among themselves. They used to call Mahathaya as Mudalai (crocodile). Ajanthi was an expert in wringing the necks of chicken, collected by raiding the neighbours chicken coops, she got the nickname “Chicken thief”. The girls, in good humour, also named one of Prabhakaran’s lieutenants, who was not very handsome, as Manmadan, The God of lust. What comes out sharply and vividly in the book is how the Sri Lankan Tamil society was dehumanized and brutalized. It perfected the cult that glorified killing and being killed. In her Rajani Thiranagama lecture, few years ago, Radhika Coomaraswamy referred to the “empowerment of Tamil women” by giving them arms and motivating them to become members of the suicide squad. Radhika added, “Unless feminism is linked with humanism, to non-violence, to hybridity, and a celebration of life over death, it will not provide society with the alternatives that we so desperately need”. Hundreds of Sri Lankan lives, including some of the brightest Sri Lankan Tamils like Neelan Thiruchelvam, Rajani Thiranagama, Lakshman Kadiragamar and Ketheeswaran have fallen victims to the reign of terror of the Tigers. Still more deplorable, many Sri Lankan Tamils escaped and took shelter in foreign countries and withdrew themselves into a shell of silence. As Martin Luther King put it, “We shall have to repent in this generation, not so much for the evil deeds of the people, but for the appalling silence of the good people”. The savage war in Sri Lanka has taken a heavy toll of human lives. It has also resulted in flagrant violations of human rights. However, what cannot be quantified is the cost of the brutalization of the Tamil society. As Rajani Thiranagama has written in the height of the conflict: “A state of resignation envelopes the community. The long shadow of the gun has not only been the source of power and glory, but also of fear and terror. In the menacing shadow play, forces complementing each other dance in each others’ momentum. The paralyzing depression is not due to the violence and authority imposed from outside, but rather to the destructive violence emanating from within the womb of our society”. The tragedy of Sri Lanka was aptly summed up late Neelan Thiruchelvam in one of his last essays: “… the violence of the victim soon consumed the victim and the victim also became possessed by the demon of racial bigotry and intolerance which had characterized the oppressor. These are seen in the fratricidal violence between Tamils and Muslims, in the massacres at the Kathankudy mosque, in Welikanda and Medirigiya, and in the forcible expulsion of the Muslims from the Mannar and Jaffna districts”. Niromi de Soyza posed the question candidly, which deserves serious introspection from all Sri Lankans, “There would never be true peace in my country as long as violence was (is) used as a means to attain it”.